Single candlestick patterns are perhaps one of the most straightforward ways of reading price action and interpreting market psychology. Candlesticks with long bodies and short wicks signify strong buying or selling momentum that is likely to carry on until a reversal candlestick is formed. Meanwhile, candlesticks with long wicks and short bodies can either reflect indecision or a battle between buyers and sellers. The most well-known single long candlestick pattern is the marubozu, which means bald in Japanese. Strictly speaking, a marubozu is either a long green or red candle with no wick at all. However, a long candlestick with very small upper or lower wicks can still fall under this category. 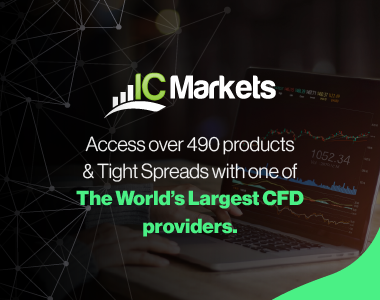 A bullish marubozu is a long green or white candle, which has an open price equal to the low of the period and a close price equal to the high of the period. A bearish marubozu is a long red or black candle, with the open price equal to the high of the period and a close price equal to the low. 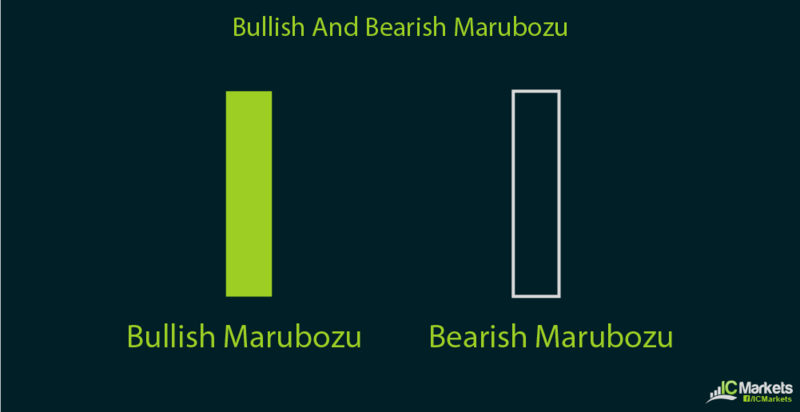 When a bullish marubozu is formed on a daily chart, this means that buying has occurred throughout the day and is likely to carry on the next day. Conversely, a bearish marubozu on a daily chart indicates that sellers were in control of price action the entire trading day and are likely to push the pair lower for the next day. Another common single candlestick pattern is the doji. This is easily recognized as a candle with long upper and/or lower wicks with practically no body. In Japanese, doji translates to a mistake, which means that plenty of action took place during the period but that price eventually closed right where it opened. There are several varieties of doji candlesticks and these are usually associated with reversals. For instance, a dragonfly doji, which is formed when the open, high, low and close of price action for the period are all equal, acts as a bullish signal when it forms at the bottom of a downtrend. A gravestone doji, on the other hand, is formed when the open, close, and low for the period are all equal and it can serve as a bearish signal when it occurs at the top of an uptrend. 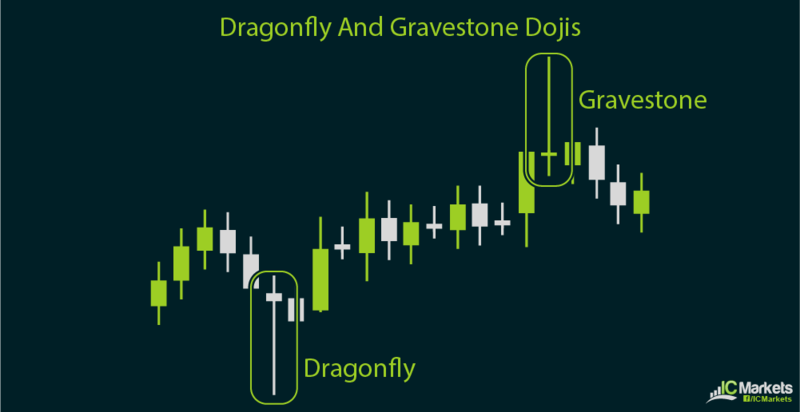 In addition to the dragonfly and gravestone dojis, the long-legged doji can also be used to signify potential market reversal. However, this usually requires confirmation from the next candlestick. Spinning tops are also treated as signals for price action reversal, although their reliability is said to be lower compared to that of doji candlesticks. Spinning tops have a small body with long wicks on both ends.